The Swiss Clown Grock was born as Charles Adrien Wettach in Loveresse. His artistic abilities became already visible at a young age when he twelve years old and performed in the restaurant "Paradiesli" as a clown and contortionist. His father was working for the restaurant. After finishing the school he worked unsuccessfully as a boy waiter for a hotel before he became a private teacher for the sons of the count Bethlen Kalman in Hungary. But his drive to the art was bigger anf finally he played for a quartet as a violinist. As an artistic interested man he soon mastered 15 instruments and especially the concertina, the piano and the violin he later integrated into his numbers. When he was engaged by the clown Alfred Prinz as his partner this was the entrance into the world of the arena which shaped his further life. They both appeared as the "Alfredianos" and played together for a certain time. In 1903 Adrien Wettach appeared under the stage name "Grock" for the first time, together with his partner "Brick" during a performance in South of France. The breakthrough followed in 1907 with his partner "Antonet" and Grock became a darling of the public at the circus. His sloppy trousers, the huge shoes and his interjection "Whyyyyy" and "Not pooooosible!" became his unmistakable logo and created a distinctive figure. From 1911 followed appearances in whole Europe, North Africa and America, not only in maneges but also in countless music halls. Thanks to his knowledge of six languages he made his international way without difficulty. From 1913 he changed completery from the circus to the music hall where he was able to act in front of the audience. The opposed partner with shirt and trailcoat was Géo Lolé at that time. When World War I broke out he went to England in 1915 and there he appeared at the music hall "Coliseum" till 1924 and inspried the growing audience. At the end Grock was the first clown who could be indicated as world famous. There was nearly no one who did not know his name and who did not connect his name with clownery, music and acrobatic. Grock moved to the Italian Riviera in 1928 where he has a gorgeous villa built. Because of his huge popularity the UFA film production realised a movie called "Grock - der geniale Clown" (31), directed by Carl Boese. But the movie failed to become a box office hit and Grock lost a lot of money as a co-producer. When a dark shadow fell on Europe Grock continued to appear in Nazi Germany from 1933 for which he was critized later. But before World War II broke out he retired from the stage and in 1944 he moved to Switzerland. There he made his comeback and there was even another movie called "Manege frei" (50). Grock also founded his own circus in 1951. Till 1954 he continued his artistic career with his circus, afterwards he retired for good. He died at the age of 79 in 1959. 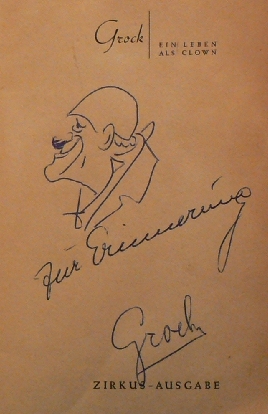 Grock wrote two autobiographies - "Ich lebe gern" (30) and "Grock. Ein Leben als Clown - Meine Erinnerungen" (51). The last mentioned book was sold at his circus and he often signed them and added a little handmade selfportrait. His villa Bianca in Oneglia (Italy), where he lived in his last days, was taken over by a trust and shall be converted into a Grock museum.